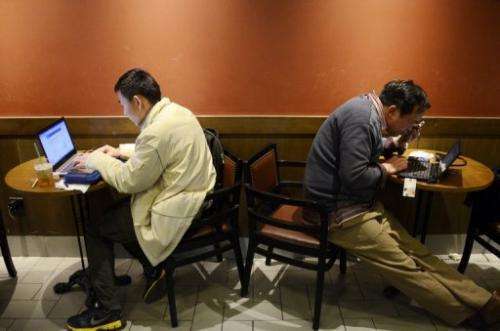 This file photo shows customers using their laptop computers at a cafe in Beijing, on November 2, 2012. Chinese authorities, who have long sought to limit access to information, seem to have reinforced the so-called Great Firewall of China, frustrating foreign companies and raising activists' concerns. The Great Firewall—the country's system of online limits and restrictions—has stepped up its targeting of virtual private networks, or VPNs, commonly used to bypass controls on websites the government considers a threat. By using proxy servers located overseas and data encryption, VPNs let users reach sites blocked due to their content or sensitivity, among them Facebook and Twitter, and are also vital to firms by enabling secure communication. At the same time they have compounded authorities' difficulties in seeking to shape public opinion and limit independent social organisation in the country's online community of 500 million, the world's largest. Now web users are complaining of VPNs being inaccessible or quickly going down once accessed, while speeds have slowed to a crawl. Some foreign-based VPN providers blame the problem on system interference due to a strengthening of controls. In a message to its users, VPN provider Astrill identified a technology update to the Great Firewall (GFW), saying the system now has the "ability to learn, discover and block VPN protocols automatically". The GFW has been built up over time since soon after the Internet began to develop in China, and uses a range of technologies to block access to particular sites' IP addresses from Chinese computers. "It's about preventing Chinese citizens from circumventing their grip on information and communication," the founder of the website GreatFire.org, which tracks online censorship in China, said in an email. In addition an army of censors keeps a close eye on China's weibos, Twitter-like microblogs inside the firewall that have been used to organise protests and challenge official accounts of events such as a deadly 2011 rail crash that sparked fierce criticism of the government. Posts on contentious issues are rapidly deleted, and sometimes those using banned terms—which can at times even include senior leaders' own names—are blocked entirely. China's Ministry of Industry and Information Technology did not immediately reply to a request for comment, but the government has previously said controls are designed to limit access to pornographic and violent content and protect children. But on Friday the state-run Global Times—which earlier this month quoted officials saying foreign-run VPNs were illegal—defended restrictions on the Internet in an editorial headlined: "Freedom not at odds with online regulation". "Problems caused by the Internet have been accumulating," said the Times, which boasts its own Facebook and Twitter accounts. "It is time to regulate the Internet." But the GreatFire.org founder, who uses the pseudonym Martin Johnson for security reasons, said it was plausible that the authorities could have tweaked the system to affect VPNs. "The GFW cannot know what the content of encrypted traffic is, but they can see that it's encrypted traffic," he said. Mainland Chinese are invited to try our technology that anonymizes surfing. It is in Beta, but should let you have access to most sites you are interested in (FB, Google, ..). You can download it for Windows from hola org, and let us know how it goes! Every attempt for censorship is smelling with something. 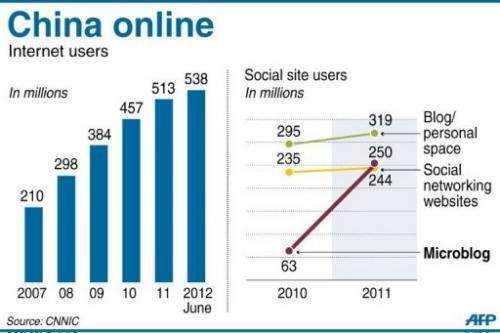 But the global social networks are cryptic systems by itself, designed for collection of information about their users. The situation, when the Big Brother censors another Big Brother systems may not be so critical for their low-end users at the very end. It's unpleasant rather for middle-tier service providers.